We completed the 2nd flight of ATom-2, flying from Palmdale, CA to Anchorage, AK. 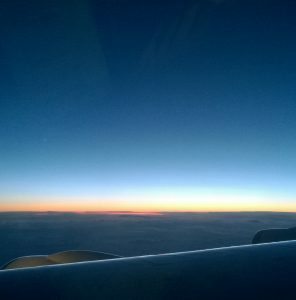 This flight provided an opportunity to look at background air, and pollution, as it is entering western United States and Canada, during winter, and to investigate winter Arctic background pollution. One of the nice things about this flight is that it provided a comparison between the two hemispheres during their respective winters. As expected, the pollution created through chemistry was lower due to less sunlight; however, what surprised me, was that the pollution levels did not get as low as what was observed in southern hemisphere winter during ATom-1. A possible reasoning behind this is the northern hemisphere has significantly more emissions, and thus pollution, than the southern hemisphere. There are many reasons behind this, including larger populations and more industry. 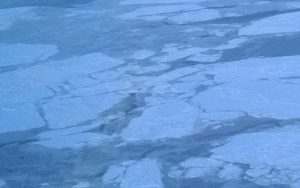 The thing that really surprised me, though, was the amount of thin and broken ice in the Arctic Ocean near the Alaskan northern coast. Arctic Ocean near Barrow, Alaska, photographed from the NASA DC-8. A large reason behind this is the fact that the Arctic region has been warming significantly more than other regions of the world. It has been well documented and observed that the sea ice has been declining during the summer, opening the fabled northern passage. However, seeing that the ice is barely recovering during the middle of the winter and small patches of open ocean still present surprised me. But on a lighter note, you cannot beat an Arctic sunset while heading to Anchorage to end the research flight. We have our next research flight tomorrow, that allows us to probe the middle of the Pacific, in the northern hemisphere, before we start investigating the equator and southern hemisphere. I will post again when I am in Hawaii.